Now that the year-end is here you’ll start seeing a number of articles of goals for next year and how they fit in your overall business plan. I’ve really thought about my goals and I found in order for me to look forward to my goals, I have to look at what worked for my business this past year. What was the HIT or MISS of my business? One item that sticks out more than anything that was a huge HIT was my business coach. Surprisingly I have found that if I didn’t have a business coach, I’d still be floundering and wondering what I was doing wrong. It’s funny because when I started as an entrepreneur I really never thought of a business coach. I rarely heard of people using them. Of course the whole entrepreneurial thing was pretty new to me too, so I was kind of in the dark. I started learning about business coaches and found that there were quite a few people in my industry. I had a chance to get to know a few and I really connected with one the most. That’s the key… to have a meaningful connection. If you don’t have a connection the coaching is NOT going to work. Type in your “industry” business coach and you’ll get SO many results. Do your research and get to know them. Get other opinions in your industry. Who has your competitor reached out to for coaching? You may not have the same personality as your competitor but this will give you an idea of how the coach works. Every good business coach has a list of testimonials of past clients. They’ll typically have a list on their website or sporadically throughout their web pages. This is a great indicator of their work. Of course you’ll want to connect with a business coach that’s going to connect with you on a certain level. Maybe a typical complaint in your industry is finding clients and the business coach has had several years experience in a specific social media platform in finding clients. He or She may have books or blog posts on details or how-to’s in becoming successful in finding clients for that particular platform. This experience is essential. They have the “Been there done that” model where it shows a proven track record. What makes a business coach genuinely concerned with what you’re going through as an entrepreneur? How do you find out if they’re REAL? Every coach has a video of themselves with their coaching lessons or advice, to enhance their credibility and authenticity. Video will show your business coach as a real person and their personality will shine through. This is a great indicator of how or if you will connect. My business coach had a ton of videos that I completely resonated with and it was one of the main reasons of going with her. If you haven’t worked with a business coach, please consider it. They will see aspects of your business that need improvement that you’d never think of. There are so many benefits to having a coach and can hold you accountable to all the ongoing plans you have for your business. Being an entrepreneur is hard work and you can’t do it alone. Your business coach will be your biggest supporter! – TWEET THIS! Have you ever worked with a business coach? Why did you want to work with that person? I hope the 5 tips to finding your ideal business coach will help you find the business coach you need to make your business successful. Blessings to you and I pray you have much success in your business next year. 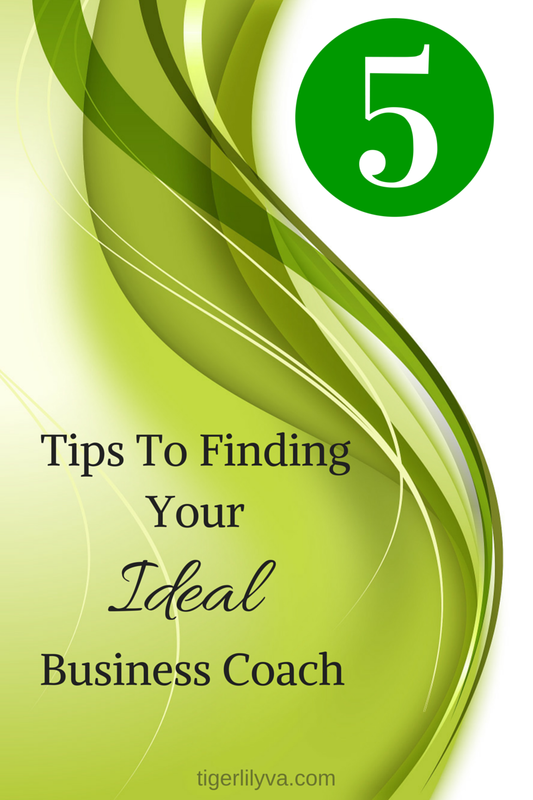 Great tip about finding your ideal business coach. It is so essential to do our homework. Google sure have so many resource for everyone to dig into. On every topic we can think of…Google it have become a thing in my house with my kids. Any time I get mum what is ? I say Google it to get more elaborated explanation to what is…? a little off topic but you get the idea.Research research, testimonials are great too. Exactly right! Isn’t the internet great?! Hi Lillian, Great post and great suggestions when looking for a coach. It is true that although many coaches are good at what they do, if there is not a connection between you and the coach, then things may not work out so well. Connection is definitely a BIG key to success! Over the years I have hired several coaches. Each one was worth every penny to me. When I started I belonged to a “coaching club” whereby there were several people in it and instructions of getting started. Then came so much more…A coach to help me develop my first product, Another coach for marketing strategies, and yet another for setting up my sales funnel. Hiring a coach is so important because if you want to accomplish something in business, you have to spend money to make money. If not, one can be floudering around wasting time…and time is money! Thanks so much for stopping by and sharing your coaching experiences. I’m so glad that business coaches have had a positive effect on your business. Time is money and it is true in order to make money you have to spend it. Invest in your business! Thanks for sharing. It is very important to find the best coach for your business because as a business owner, you need a coach. A coach that is right for your needs. Without one, you may be struggling! I have found that to be true anyway. I think a lot of business owners don’t realize it’s time & money invested in their business. For someone who has no idea what to look for on Google, it reminds me of when I first joined Facebook. How was I go go about finding friends??? I soon learned that one thing leads to another, and before I knew it, I had so many friends I couldn’t keep track of them all! I never had to look for a business coach. I had one before I ever knew I needed one! You’re spot on, that no one can do it alone. Thanks! It may be a strange question for some people. Sometimes they need a bit of a nudge in the right direction. I’m so glad you found a coach that works for you right away! Hey Lilian, you’re right. Finding the ideal business coach is SO crucial to your success. That applies to any business, even if you’re a self-motivated person! Thanks so much for stopping by. I’m so glad we agree that a business coach is crucial to your success, no matter what type of business you are in. I have my mentor now. YAY !! I really never thought about the differences regarding coaches and mentors. I suppose my coach has become my mentor since she has been part of my support system for more than a year. It’s been an ongoing relationship and definite friendship. Having a business coach can make all the difference in the world. It’s just like personal coaching, it takes an outsider to help us see clearly!